ANOTHER OP'NIN' Broadway stars light up the park's open-air stage. 'I would rather be a superb meteor, every atom of me in magnificent glow, than a sleepy and permanent planet." With this quote from Jack London, Transcendence Theater Company kicked off its second season of Broadway Under the Stars last week on a warm, breezy evening at Glen Ellen's Jack London State Park. Recited by artistic director Amy Miller, those stirring words have become the traditional opening for TTC's revues, held within the roofless ruins of London's stone-walled winery. Titled Fly Me to the Moon, the company's first two-weekend-long show of the season will be followed later in the summer by Fantastical Family Night (July 19–20), the variety revue Dancing Through Life (Aug. 9–17) and the season-ending Gala Celebration (Aug. 30–31). All shows feature an assortment of singers and dancers culled from the world of professional theater. Fly Me to the Moon—the theme partly inspired by the surrounding Valley of the Moon—mixes 30 songs (some classics, many less familiar) with dance routines and the occasional literary quote. Last year, the company established this unique blend of first-rate entertainment served up with a dash of old-time revival energy, using the music of Broadway to illustrate the life-changing power of pursuing one's dreams and the necessity of taking chances. Starting with a rousing opening that combines snippets from The Sound of Music with "The New World," from Jason Robert Brown's Songs for a New World, the otherwise sensational opening was marred a bit by some microphone issues, which persisted occasionally throughout the show. Fortunately, nothing interfered with Stephan Stubbins (the company's co-executive director) and his magnificent, deeply felt rendition of "As If We Never Said Goodbye" from Andrew Lloyd Webber's Sunset Boulevard. It's amazing how many surprises can be discovered in a well-known song when presented by a truly gifted performer. Other highlights, in a show full of them, include Morgan Karr's giddy, energetic performance of "In These Skies" from Taylor and Oberacker's aeronautical adventure Ace; the brilliant Carrie Manolakis' miraculous turns with Scott Alan's beautiful "Never Neverland" and Leonard Cohen's "Hallelujah"; and Nili Bassman and Kurt Domoney's impressively flirty "Shall We Dance" (from George and Ira Gershwin's Crazy for You), reminding us how much fun it can be falling in love. Clearly, TTC remains committed to presenting shows that, like London's "superb meteor," light up the night, while setting fire to the hearts and imaginations of those lucky enough to witness it. 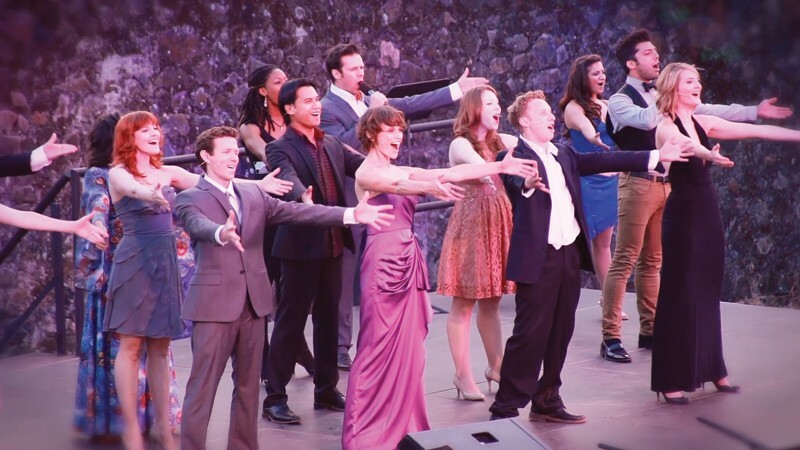 'Broadway Under the Stars' runs through Aug. 31 at Jack London State Park, 2400 London Ranch Road, Glen Ellen. All shows 7:30pm. $29-$117. For full info, see www.broadwayjacklondon.com.